as low tide changes course. as waters disappear in clouds. Written for dVerse where Victoria asks us to rewrite an older poem and add some imagery. The original Glisten is the first poem I posted when I began this blog in March 2015. 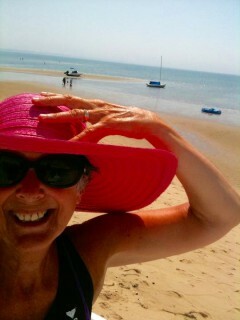 Photo: Provincetown, on Cape Cod. Found the original and love the upgrade. Wonderful poem 2.0! Well done, Lillian! Thanks! Have been off grid since last Wednesday — back in town last night so reading this morning with my second cup — glad you enjoyed! I just did add the link to the original. Hi. I couldn’t find. Could you please come back and update your post with the original? thanks. Hi there! So sorry — forgot to link it to the original — which I just now did. Have been in the Adirondacks since Wednesday — gorgeous woods, lakes, black skies and huge stars — but no internet — or spotty in the rare moments of connectivity. But, am home now — just finished reading all the quadrilles and am catching up. Will get to Monday’s haibun in a bit. Hope you enjoy thei first Glisten too — written so long ago 🙂 It’s linked now in the explanation. I couldn’t find the original, either, Lillian, but do love this one. The phrase glisten dance is so perfect for what you are describing. I echo Toni and would love it if you would add the first one or provide a link to it. It’s so fun to see the progress! Ugh, Victoria. Apologies! I did not read the prompt completely as we were packing for our Adirondacks trip — scheduled the rewrite so it would appear while we were gone. Almost zero connetivity to internet in the Adirondacks but oh, the connection to the glory of the earth! Woods, the loons calling in the night, the blackest sky with the hugest stars. Wonderful wonderful. Oh, saw your “search” when I was leaving. My vote goes for the revision! Of course. Beautiful picture and revised poem Lillian. Love the rediscovering of love. Loved “glisten dance.” Wonderful poem. I love that “sunlight does a glisten dance.” It’s one of those lines that will stay with me! Ah, Sanaa, you are so wise! 🙂 Have been away for five days with no internet connection so did not get to read others’ in this prompt. Just getting back to the “world” as we know it — for me, that’s Boston. Glad to read your words here and so glad you enjoyed! The repetition in this poem not pulls the reader along but ties all the emotion together. Nicely done. So nice to read your words with my second cup! Have been in the Adirondacks for 5 days with no internet connectivity — well, rarely sporadic so it basically was nonexistent. I must say, it was refreshing to be “away” from the world! But, nice to return too! Ah yes….your autumn will truly bring a change of seasons in your life. Let the tears flow my friend, as you hug her goodbye….and know that you’ve done a wonderful job (although that’s not really the right word) of mentoring to this leaping off moment in time. She shall always be connected to you….just that the tether becomes a gossamer strand. Lillian, you are quite the traveling lady!